This posture is known as Buddha Dispelling Mara. 'Mara' means evil, or fear. It is the grounding gesture of touching the earth that dispels Mara, allowing Buddha to focus on meditation, detaching himself from the emotional response of fear to the disturbance of Mara. An excellent online source for buddhist texts, both online and through their CD-ROM, the Internet Sacred Text Archive CD-ROM 3.0. Includes Mahayana, Therevada, Tibetan and Zen texts, along with ancillary materials, not to forget thousands of documents from the world's many religions, philosophies and arts. The Wikipedia Free Encyclopedia is an exquisite result of the internet. This is an excellent Buddhism resource, well-written and fully hyperlinked through the Wikipedia encyclopedia. One of the internet's enduring websites and a very good resource, inlcuding locally maintained information such as the Buddhism FAQ. For example, "Do Buddhists believe in God?" 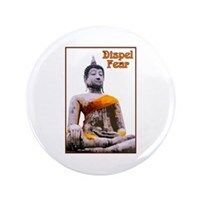 Theists, agnostics and atheists are all welcome within Buddhism (and in this group); Buddhists make up their own minds about the existence or nonexistence of deities, if they get around to it. Some people find this question uninteresting, feeling that neither a 'yes' nor a 'no' answer contributes meaningfully to the elimination of suffering. The Mahayanists ... did not see themselves as creating a new start for Buddhism, rather they claimed to be recovering the original teachings of Buddha, in much the same way that the Protestant reformers of sixteenth century Europe claimed that they were not creating a new Christianity but recovering the original form. The Mahayanists claimed that their canon of scriptures represented the final teachings of Buddha; they accounted for the non-presence of these teachings in over five hundred years by claiming that these were secret teachings entrusted only to the most faithful followers. I have a personal preference for the more light-hearted Mahayana forms over Theravadan asceticism. Whichever is the 'truer' form of Buddhism, I prefer the inflection that the filter of Chinese Daoism placed on the path which is best summed up by a Tendai proverb: To a Tendai monk, everything is wonderful. That is, in The Vinegar Tasters, Saicho would be smiling alongside Laozi. The following is excerpted from Tendai for Americans, reproduced in full on the site. According to the Tendai view, all men, without exception, possess in their innermost being, the Buddha-nature, and are, therefore, capable of attaining to Nirvana. There are none who are doomed, except by themselves. All that is required is sincere practice. Just to give you an idea what monastic life is like. Source from Gerald Roscoe's The Monastic Life. Two hours before the sun appears on the eastern horizon the pealing of the temple bell signals the time, 4 a.m. In the kuti the monks, having spent the night on a thin mattress under a plain cotton blanket, open their eyes and rise from sleep to start the day. The Buddha said that four hours sleep should be enough for a monk, but nowadays monks generally sleep at least six hours, and when the bell wakes them, there is no hesitation about rising. One of the first things to be said about this book is that it is eminently readable. It should make a powerful appeal to two kinds of persons. First, those largely ignorant of Buddhism who are sincerely eager to repair that ignorance will find it exactly what they need. Second, a good many people with a fairly extensive knowledge of Buddhism would be happy to have it on their bookshelves because it provides a complete summary of all the essentials of Buddhist teachings and practice. Dukkha should not be translated [simply] as suffering because there is plenty of experience in the world which is pleasant but, like all conditioned things, is impermanent, and therefore even though it is not suffering it is dukkha. This beautiful book documents in image and text a peculiar yet exhileratingly unique group of monks. The Tendai monks of Mount Hiei in Kyoto include among their buddhist practices running marathons. But to a Tendai monk, "marathon" means running approximately 26 miles every day for a year. In hand-made straw sandals (several pairs a day). In 1995, the Nomadic Spirit had the pleasure of visiting the monks of Mt. Hiei's Shugakuin temple. There are photographs and an Nomadic Spirit entry on this site. A gallery of photographs featuring Buddha images from around the world. A meditation on climbing meditation...sort of. Life is not all suffering: there is glee. On being a monk in Thailand, and other corrections. But in the morning, he suffered. Perhaps I was brought up too westernised to avert myself from all that suffering when there's so much fun to be had? A little prose poetry inspired by the Shugakuin monastery on Mt. Hiei in Kyoto. The Pali Canon on CD!